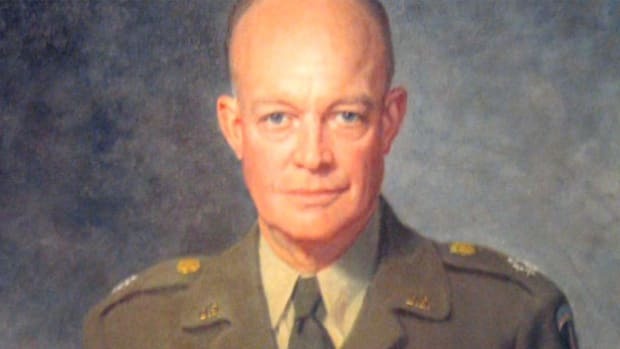 As supreme commander of Allied forces in Western Europe during World War II, Dwight D. Eisenhower led the massive invasion of Nazi-occupied Europe that began on D-Day (June 6, 1944). 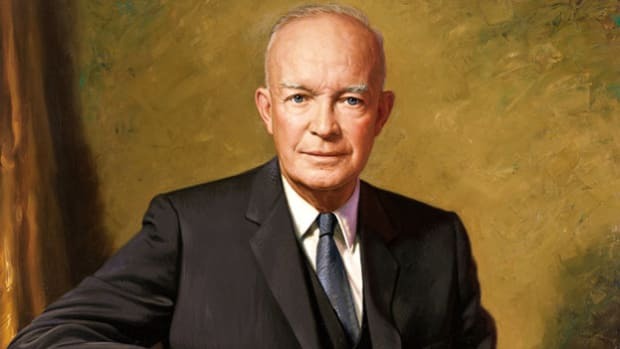 In 1952, leading Republicans convinced Eisenhower (then in command of NATO forces in Europe) to run for president; he won a convincing victory over Democrat Adlai Stevenson and would serve two terms in the White House (1953-1961). During his presidency, Eisenhower managed Cold War-era tensions with the Soviet Union under the looming threat of nuclear weapons, ended the war in Korea in 1953 and authorized a number of covert anti-communist operations by the CIA around the world. On the home front, where America was enjoying a period of relative prosperity, Eisenhower strengthened Social Security, created the massive new Interstate Highway System and maneuvered behind the scenes to discredit the rabid anti-Communist Senator Joseph McCarthy. 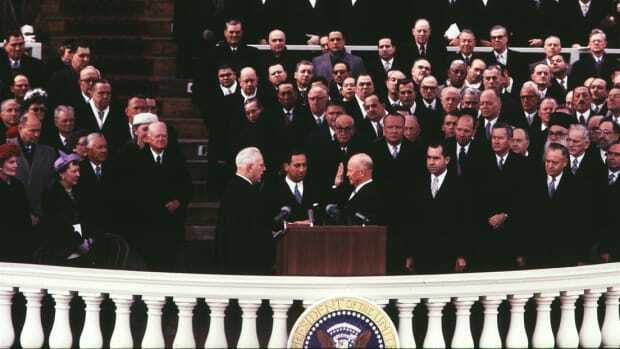 Though popular throughout his administration, he faltered in the protection of civil rights for African Americans by failing to fully enforce the Supreme Court’s mandate for the desegregation of schools in Brown v. Board of Education (1954). Born in Denison, Texas, on October 14, 1890, Dwight David Eisenhower grew up in Abilene, Kansas, as the third of seven sons in a poor family. 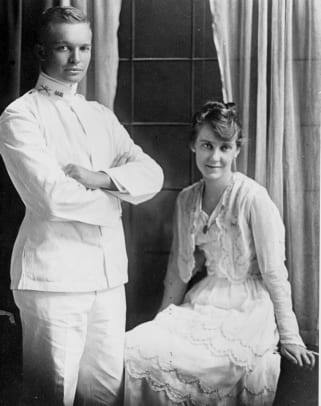 To the distress of his mother, a devout Mennonite and pacifist, young Ike (as he was known) won an appointment to the U.S. Military Academy at West Point, New York, and graduated in the middle of his class in 1915. 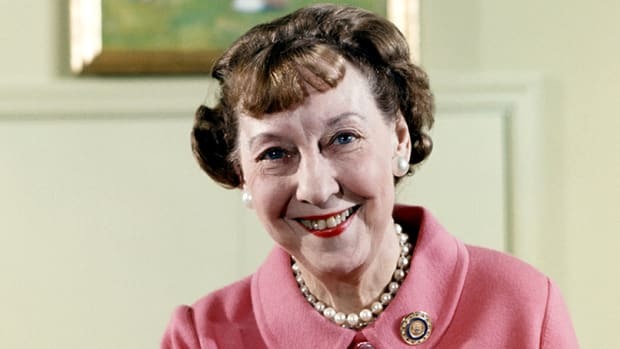 While stationed as a second lieutenant in San Antonio, Texas, Eisenhower met Mamie Geneva Doud. The couple married in 1916 and had two sons, Doud Dwight (who died of scarlet fever as a small child) and John. Did you know? At the Potsdam Conference in July 1945, General Eisenhower was among those who opposed the use of the atomic bomb against the Japanese cities of Hiroshima and Nagasaki. 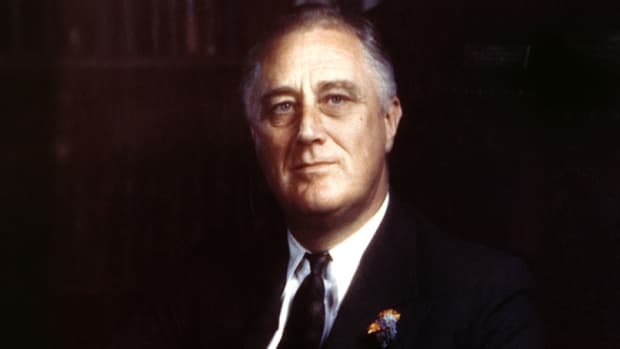 He argued that Japan was on the verge of surrender already, and that being the first to use such a fearsome new weapon would damage U.S. prestige in the international community just as it had reached its highest point. World War I ended just before Eisenhower was scheduled to go to Europe, frustrating the young officer, but he soon managed to gain an appointment to the Command and General Staff College at Fort Leavenworth, Kansas. Graduating first in his class of 245, he served as a military aide to General John J. Pershing, commander of U.S. forces during World War I, and later to General Douglas MacArthur, U.S. Army chief of staff. During his seven years serving under MacArthur, Eisenhower was stationed in the Philippines from 1935 to 1939. 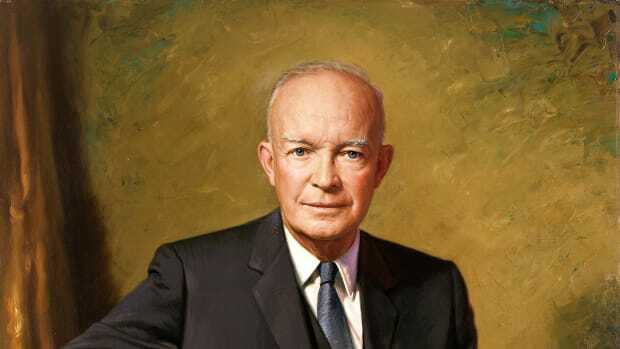 Eisenhower returned soon after Nazi Germany’s invasion of Poland sparked the outbreak of World War II in Europe. In September 1941, he received his first general’s star with a promotion to brigadier general. After Japan attacked Pearl Harbor that December, U.S. Army Chief of Staff General George C. Marshall called Eisenhower to Washington, D.C. to work as a planning officer. Beginning in November 1942, Eisenhower headed Operation Torch, the successful Allied invasion of North Africa. He then directed the amphibious invasion of Sicily and the Italian mainland in 1943 that led to the fall of Rome in June 1944. 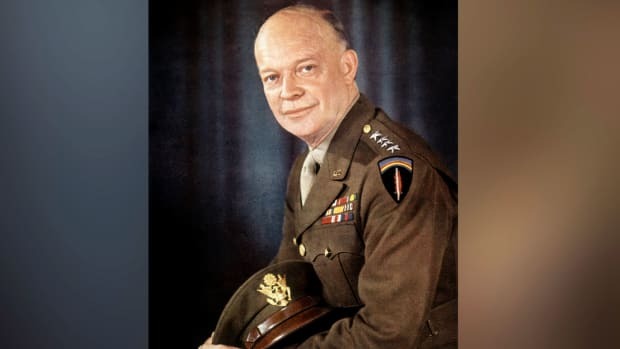 Made a full general in early 1943, Eisenhower was appointed supreme commander of the Allied Expeditionary Force in December of that year and given the responsibility of spearheading the planned Allied invasion of Nazi-occupied Europe. 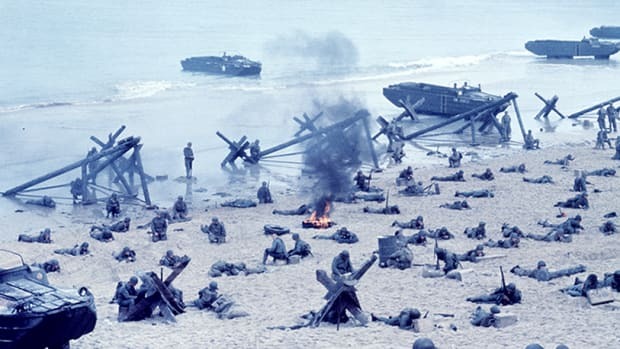 On D-Day (June 6, 1944), more than 150,000 Allied forces crossed the English Channel and stormed the beaches of Normandy; the invasion led to the liberation of Paris on August 25 and turned the tide of the war in Europe decisively in the Allied direction. Having risen from lieutenant colonel in the Philippines to supreme commander of the victorious forces in Europe in only five years, Eisenhower returned home to a hero’s welcome in 1945 to serve as chief of staff of the U.S. Army. 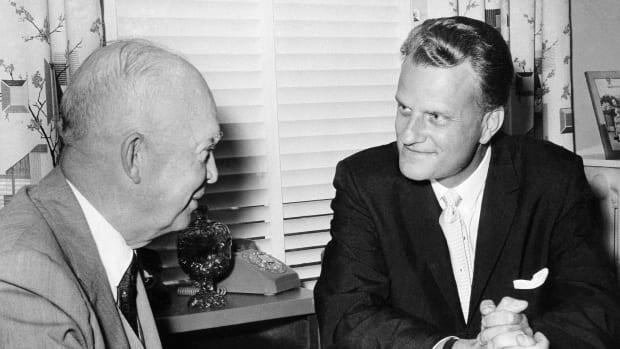 Though U.S.-Soviet relations remained relatively cordial throughout his presidency, including a summit meeting with Premier Nikita Krushchev in 1959, the Soviet shooting of a U.S. U-2 reconnaissance plane in May 1960 dashed Eisenhower’s hopes for a treaty before he left office. In his farewell address of January 1961, Eisenhower spoke of the dangers inherent in what he called the “military-industrial complex.” Due to the combination of national defense needs with advances in technology, he warned, a partnership between the military establishment and big business threatened to exert an undue influence on the course of American government. 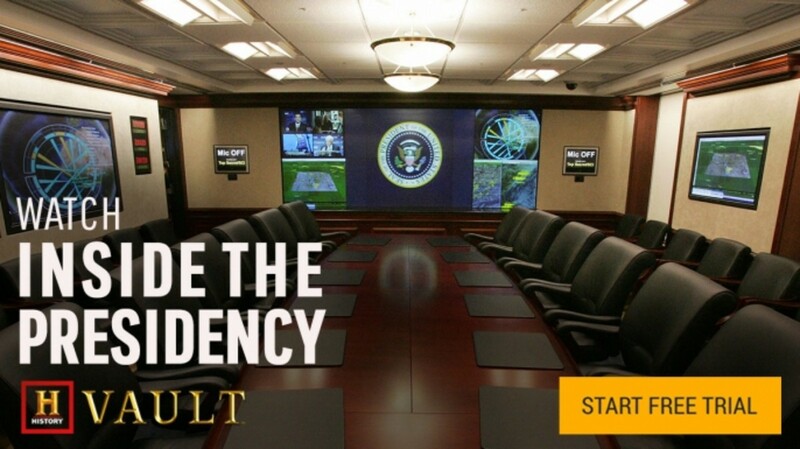 His warnings would go unheeded, however, amid the ongoing tensions of the Cold War era.